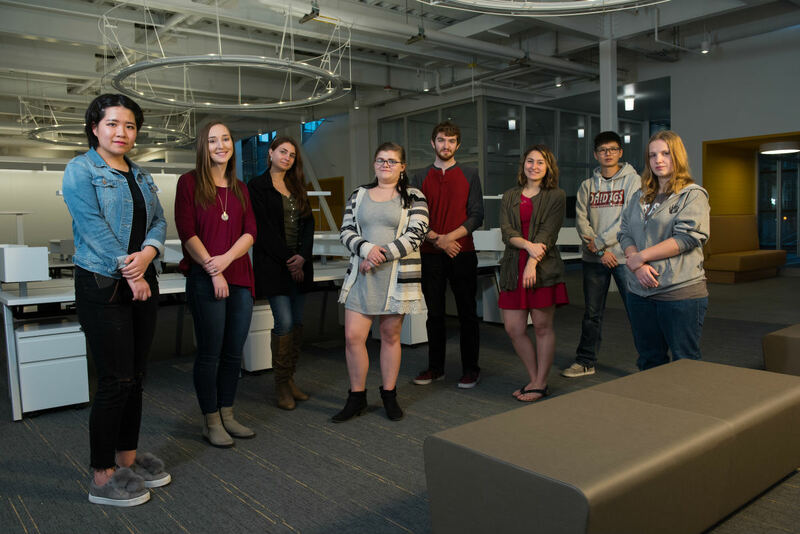 Eight of the 16 Vandals in Focus team members pose in the Integrated Research and Innovation Center. The team brings together student writers and photographers, as well as an illustrator and video producer. Vandals in Focus is about showing future and current Univer­sity of Idaho students that opportunities for research and scholarship can be found in any major U of I has to offer. Dave Pfeiffer, director of the U of I Office of Undergraduate Research, is dedicated to sharing this message. Vandals in Focus is now in its second year, and its staff, as well as the number of students it features, is growing. The footwork is done by a team of 18 undergraduate writers and photographers from multiple disciplines, as well as a videographer who produced short videos about undergraduate research, and a graphic artist who designed the cover. Working on Vandals in Focus gives the students a variety of learning experiences in different aspects of journalism and communications. Keegan Lawler, 20, is an English major and a writer for Vandals in Fo­cus. He was first introduced to this project by a friend who forwarded him the application information. Vandals in Focus photographer Irish Martos, a 24-year-old senior studying psychology, is in her second year working on the project. She loves her Vandals in Focus experience for more than just the fact it looks nice on a resume. Interested in working for Vandals in Focus 2017? Email Tara Roberts at troberts@uidaho.edu. WRITER: Morgan Ward is a junior from Fruitland, Idaho, majoring in history and minoring in creative writing. Photo by U of I Photo Services.